Looking to get a suction cup camera mount and I wanted to see if anyone has played with them yet. 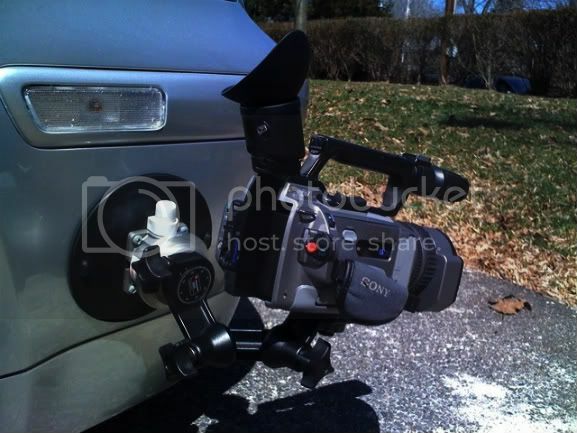 -Has anyone used one of these on a car or motorcycle with their Canon 7D? -Should I be concered about wind force if mounting on a motorcycle/car? -If you have used one, which brand is trust worthy? I would be really weary of trusting any suction mount, even with failsafe tethers. Just going by experience with those suction mounts that come with GPS navigators, I've had them pop off after a few hours in the warm sun. Even when both surfaces are pristine I would be very cautious. Then again, the one you posted looks pretty rugged. Tim, that suction cup is great. I've used it plenty of times with cameras between the size of a Sony vx2100 and a Flip cam. You can rip a fender off with this thing, but I always use some sort of leash just incase. Mike do you have the same brand? There's a big difference between a plastic suction mount for a gps and a professional 6" suction cup. I've used suction mounts with Varicam's and F900s, I'm sure a little 7D will be safe and sound. Manfrotto make a nice little kit that should see you okay as do Hague, Mathews and quite a few others. I've used the Bogen version of that. It's exactly the same except for a blue cover instead of a yellow one. The only problem I have ever had is the head wasn't tightened all the way, so the camera flipped over and the mic was ripped off! That was my fault for not double checking the knobs. The suction cup itself worked perfectly. It's not actually a suction cup though, it's a vacuum cup, similar to what you use to install pane glass. When the vacuum starts to come loose, the pump shows a red line. A few more pumps will retain the seal. I've used it with a DVC30 with a shotgun, wide angle lens, and large battery, so a 7D should be fine. I bought an over priced delkin fat gecko from samy's a couple weeks back.. ive mounted it to my car, a cop car, a window and even those things over a stove... and so far so good.. i wanted to test out how fast I could go and I got up to about 50mph (it was mounted right behind my left front wheel, like those old A-team shots, while holding the strap with my hand) and it held sturdy. Although, I do still feel nervous everysingle time its on a moving vehicle. I also have used a super clamp, which isn't as versatile but I never have any doubts..
Tim, this may help you. My contribution. Done with the Manfrotto Car Mount. Single 6" cup only. I'm really nervous as u can see. I wanted the filmtools rig but they do not ship to Singapore. Levi's setup would have worked much better. Don't leave out the Stickypod. I haven't used mine with the 7D yet. But it worked well on my HV20. Four suction cups on the model I had. A bit shaky with the wideangle unbalancing the camera.